I’ve been planning out what books I want to personally read for the last two years. It’s been such a helpful thing that I decided it was high time I start doing this for our read-alouds, too. 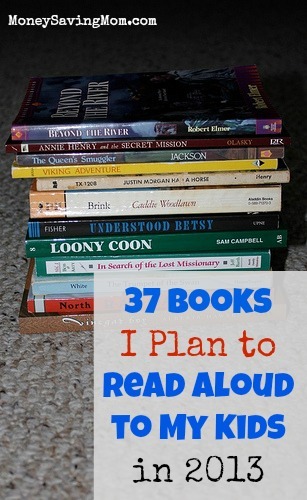 37 read alouds might seem like a lot to some, but reading is a very big part of our lives. I feel like raising my children to love learning and teaching them how to love good books is one of the greatest gifts I can give to them as a mom. Therefore, we do a lot of reading at our house. And we’ve sought to weave it into our everyday lives so that it just naturally happens. As you’ll notice, we typically combine meals and reading aloud. My mom often read to us at lunch when I was growing up and I loved it, so we’re carrying on the tradition in our home, too. I’ve also been meeting one-on-one with each child each weekday and we usually spend at least 15 to 20 minutes of that time reading a book together. If you want to start reading aloud to your children but you have no idea where to begin, check out my post with tips on how to start reading aloud to your children. For more book ideas, check out this list of Books We Read Aloud in 2011 and our list of Books We Read Aloud in 2012. Do you have any books you’re planning to read together as a family this year? Do you mind reminding us of your children’s ages? I would love to start reading Anne to my daughter but haven’t been sure what age would be most appropriate. Thanks! I just added them to the post. Thanks for the suggestion! Love this list, as I am making my own list for the kids. I always and looking for new ideas! I’m curious. How do you work out individual reading time with each child? I currently only really read to my oldest though my 2 yr old often listens in. When they get older I love the idea of reading with them by themselves though! As part of our homeschool schedule, we have a time where I meet individually with each child to go over their independent work, do some one-on-one homeschooling lessons, and read together. While I’m doing this with one child, the others are working on their individual work that they can do independently. It’s been so good to have this one-on-one time to connect with each child every day… they seem to love it and I do, too! 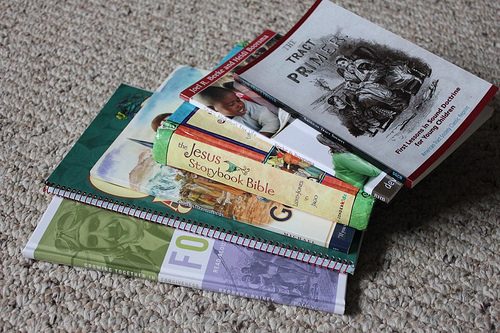 I know you have a large readership who do not homeschool, but I know some of us do. I would LOVE for you to share more some time about your schedule there and how you divide up that time/how much time with your other obligations. That is where I struggle. Obviously the schooling of my children takes precedence, but I can’t let the house fall down around me. I struggle to find a balance and get everything done. I would love to read about this as well! I am just starting with homeschooling my preschooler and love seeing how others manage their day with multiple children. I’d also love to hear more about your schedule and how you structure learning! Our church is using the The Jesus Storybook Bible: Every Story Whispers His Name for a 1 year whole church lesson plan this year. Starting this Sunday/Wednesday this whole church is moving through it together. My husband and I do the lessons for children’s church so we are doing the lessons in there. The adults are doing it on Wed nights, the kids and teens are doing it on Sun mornings. But every week we will all be on the same lesson, though they kids and teens will be a few days ahead all the time. We are really looking forward to having this change, giving families a way to reflect back on lessons together as a family more so than just hearing a sermon/lesson and it going in one ear and out the other. It’s a whole new take on ministering to the whole family I think. Love this. That’s one of the few books on the list that we’ve read before. We’ve been so blessed by it that I try to read through it at least once every year as a refresher! We have the version of the Jesus Bible Storybook with the CD. My children have listened to it each night as they fall asleep. After 2 years of it, I cannot believe how much they have retained. If you start to read it they can recite the story by heart. I love that they have such precious truths ingrained in their minds. I also heartily recommend the authors new devotional book for children- Thoughts to make your heart sing. Although my children are now grown they were read to daily before they could talk. All three of them are excellent readers now and for that I am so grateful. We’ve loved the Little House books and Charlotte’s Web. I’ve got to check out Pippi Longstocking; that sounds like a fun one! My oldest daughter is ten and we’ll be reading Nancy Drew together this year. She got the first 6 books for Christmas and it will take most of the year to get through those. My youngest is five and we just pick up picture books from the library to read aloud. Understood Betsy was one of our very favorite read-alouds this past year. And my 6 year old also loved The Hundred Dresses. Oh, and Stone Fox was another on we loved. I have girls 10, 8, 6 and a boy 3 1/2. I have difficulty doing individual read-alouds because all of my others don’t want to miss out on a good book! Also, I notice we use the same curriculum for homeschooling. Do you read these books (listed in your post) instead of or in addition to the scheduled read-alouds? Don’t expect Nancy Drew to take the whole year–at least not just six books of it! I bet your daughter will get drawn into the adventure/excitement and read many more! You might just want to look for longer picture books (like the longer Dr. Suess stories, or books from the Juvenille Picture Book section of your library). For a three year old, hearing rhyming words and stories where he/she can guess what will happen next or recap beginning/middle/end will go a longer way in helping build beginning reading skills. If you really want to move into chapter books, you might consider The Great Illustrated Classics series. They have a picture every other page, so as you are reading the longer text, they can look at the picture (they are all black and white). They offer simplified versions of great classic stories. They are also great for kids who like to read independently. My 7 year old has read probably 8 of the books on his own. I can almost always find a couple at Goodwill or other resale or used book shops – usually you don’t have to pay more than $2/book for a hardback. Check out the My First Little House books. Same stories, but simply written with beautiful pictures. My preschoolers love them. Understood Betsy is fabulous! I have a really old copy that I read as a child. I need to find it and read again now that you have reminded me! 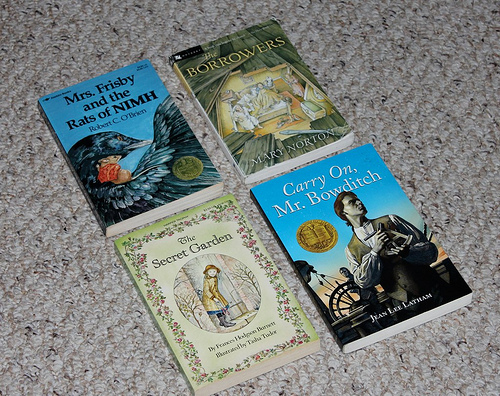 And of course The Secret Garden, The Borrowers, Little House on the Prairie, Anne of Green Gables etc are classics! I notice you are reading the Paddington books. 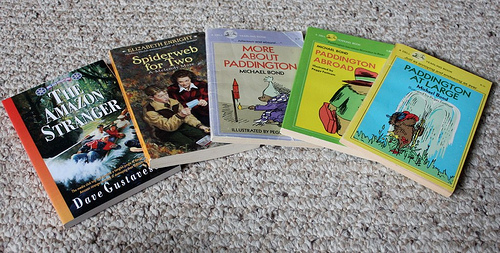 I grew up with Paddington (my dad is British) I had a Paddington lampshade, all the Paddington books, and watched all the Paddington cartoons. I also once had a real stuffed Paddington bear and my British relatives once sent me Paddington shaped candies in the mail. I still have the Paddington apron I got as a child along with the Paddington tea tray and my sister has our Paddington cookbook. My sister and I had a blast at cooking out of the cookbook, it had a lot of ethnic dishes that are very British so it would depend on your taste buds if you would enjoy it or not. Rereading this I noticed I am sounding like a Paddington nut but keep in mind I was probably 6 0r 8 years old when I collected all this stuff, and most of it is now long gone. Victoria, my 5 year old LOVED Paddington. We read it this year. We can’t wait to read the rest of the books. I’m sure he would totally love a little Paddington Bear too! We are big fans of reading, too. I have a question about books and your “simple” lifestyle, though. Do you buy and keep all/most of the books you read and read to your kids? My husband is a pastor, we home school, and just generally like books, but I am constantly overwhelmed by the care and storage of all our books. Any thoughts or ideas on this?! On a more positive note, we’ve done the Mrs. Piggle Wiggle Series this year, as well as lots of picture books and books for school, a couple missionary biographies, Scout by Piet Prins, and my husband just started reading the Hobbit to our boys. One other way we sneak in reading: always keeping a read aloud in the car. My husband reads whenever we have to sit and wait (usually to the kids while I run in to a store)! Our kids love the Jesus Storybook Bible, and we’ve used several other picture Bibles during our nightly family devotions, but our favorite by far is The Story Bible by Concordia. If anyone likes the Jesus Story Book, this is the one I think one would want for the next step up (it says for ages 3 and up and we used it with ages 3-7). http://www.amazon.com/The-Story-Bible-Edward-Engelbrecht/dp/0758619022/ref=tmm_hrd_title_0 It is excellent and true to Scripture – great questions at the end, and not moralistic. Reading over my comment, I realized that putting in quotes could be read as mocking or along those lines – it was not meant that way at all. Reading over my comment, I realized that putting SIMPLE in quotes could be read as mocking or along those lines – it was not meant that way at all. I wish there were a way to edit or delete comments! I am usually in the car with the kids without my husband so we check out audio books for the car. We did The Wind in the Willow this summer (my boys loved it) We started Charlie and the Chocolate Factory, but the Disc was damaged. We also did Trumpet of the Swan (again they loved it!) Right now they have the Hobbit (again). Wow! Do you buy all your books ahead of time? I’m going to look into the paddington books! I get most all of our children’s books used — typically from PaperBackSwap. Hi Crystal – I love your site (and your book) and am very slowly implementing many of your ideas. You are such an inspiration to me – esp in the areas of setting goals and being disciplined to make small changes over time. I love to read as well and so do my boys (twins, age 9). I thought I would recommend some books that we really enjoyed as well (maybe for your 2014 list!) One is Sarah Whitcher’s Story and the other is Mountain Born, both by Elizabeth Yates. We also enjoyed The Mouse and the Motorcycle by Beverly Clearly that we listened to over a long car trip. Oh, we loved both of those Elizabeth Yates books — they were part of our homeschool reading from the past two years. And I’ve never heard of The Mouse and the Motorcycle. Thanks so much for the recommendation! Beverly Cleary (author of The Mouse and the Motorcycle) is a wonderful, classic children’s author! Her book Socks (about a cat) was one of my favorites growing up; another of her books is a neat book about a dog named Ribsy. Ramona (probably her most famous character) is a milder version of Junie B Jones. The magic tree house series are fun too! Oh my goodness, “Carry On, Mr. Bowditch” was one of my favorite books when I was a kid! I haven’t heard anybody mention that book in years. I read it over and over. I loved the way Mr. Bowditch used a grammar, a Bible, and a dictionary to learn a bunch of languages. I wanted to become a scholar just like him. Something about that book just always made me so excited! Hope your kids love it! Your dinner books were some of my favorites when I was young. Thanks for the list. How do you do the read at lunch or dinner? When do you eat? I have generally eaten when Doctor Destructo eats, otherwise, its nap time when I can sit down and eat. But if I read to him while eats (which I love the idea of), then I don’t get time to eat. Anyway, I’d love to read how you do this (specifically with when everyone eats and how you read and eat at the same time or what have you). How long do you read at each meal? I’ve got a 3-year old and baby and by the time I feed the baby, the 3-year old is antsy. But the baby will soon enough be feeding himself and I could start some reading. Do you go by time or chapter? Typically only for about 10-15 minutes at breakfast and dinner. It’s usually more like 20-30 minutes at lunchtime. I have been reading aloud to my son since he was born. Even though he is 6.5 now and is reading at a 4th grade level I tend to still read to him at night. When he was younger I used to read to him while he played in the bathtub. Love the idea of reading at bath time! Thanks for the inspiration! I love the idea of reading aloud at mealtimes. At what age did you start reading chapter books to your kids? I have a 2.5 year old and would love to do this with her, but I wonder if she’s too young to get much out of it. I’m not Crystal, but I’ve found that if we read *while* the kids are eating, even my one-and-a-half-year-old will usually sit still. I don’t know how much she’s picking up, but I’m sure a two-and-a-half-year-old would at least grasp some… plus it’s such a good habit to start when they’re little! Yes, definitely start young – it’s absolutely amazing what they soak in and it is such a fun time to share together and help them nurture their own love of reading! Crystal, my favorite devotional book to read to my kids was from when I grew up. They still sell it on Amazon. It’s called “Days on the Farm with Annette and Samuel.” The author is Teresa Morgan. Just thought I would pass this along as it would be good for all 3 of your children’s current ages. Thank you for sharing this list and making a board on Pinterest of your favorite books to read to children! I set my own reading list for 2013, and I like the idea of reading aloud to my kids. I think I will borrow some of your book choices over the years to read to my kids. I love the idea of 15 minutes of reading time with each kid, too. Thanks for the great suggestions! Great job, Crystal, for planning to read aloud to your children on a regular basis. In a “Teaching of Writing” class, I learned how helpful it was to read aloud to children of all ages to improve their writing and speaking skills. Not only are you teaching them to love good literature, but you are also teaching them vocabulary and writing style as well as bonding with them. I absolutely loved some of those books as a kid! I love, love, love The Jesus Storybook Bible. Its so good and one of the favorites in our house. I’m so glad I found your site! We are in the process of becoming foster parents, and this post came just in time! Reading is a very important part of any child’s life, and since it’s been a while since we’ve had little ones in our home, I had no idea what books to read to them! I’m going to review your 2011 and 2012 lists, as well. THANK YOU!!! God bless your ministry here in 2013!! My kids are older now but I remember reading to them many Richard Scarry’s childrens books. There were a few favorites that I guess were read a few hundred times over the years because the kids requested them over and over. I loved this series so much as a child that I re-read it in 2012 . . . at the age of 30! And I still loved it! When you’re done with those, don’t forget “Thimble Summer”, also by Elizabeth Enright, if you haven’t read this gem already. And I LOVE the idea of reading to my children during mealtimes. They’re all under 3, so they won’t understand too much of the chapter books, but I’m going to try it anyway. Loved reading your list. It took me back to the years we homeschooled our children and had many a DEAR Day (Drop Everything and Read). We especially loved Carry on Mr. Bowditch. If you have not read The Bear That Heard Crying to your children, I highly recommend it. I think we may have read that story 50 times over the years. It is set in 1783 and is based on a true story. We loved that book! I need to read it again to the children sometime soon! It’s one of our favorites too… I need to pull it out and read it again! What an incredible story. What a wonderful goal! My children are all grown with only one still at home and not married, but I am so looking forward to reading to my grandchildren as they get older! Just to name a few of our favorites. My husband and I always sought to read books that may have been considered a bit advanced in vocabulary to our children. It is amazing how much a child can understand through context. Do enjoy and savor your read aloud moments! We read to our children through high school and my husband still reads aloud to our son and me on Sunday evenings. My husband and I have started making a great effort to read together and although we aren’t able to do it every night, I just adore that time together, soaking in a wonderful story side by side. You too are blessed with a husband who reads to his family! Most might consider the ages three through five to be young for the reading of Henty books, however our youngest son,when around the age of four, listened with rapt attention when his older siblings were being read the Henty books and he loved them. Beric the Britain is a good Henty to begin with by recommendation of my Henty fans. So glad someone mentioned One Morning in Maine. One of our favorites too! We recently ‘discovered’ the Jesus Storybook Bible and have all been blessed by it- kiddos and parents. I bought it for all our neices and nephew this year for Christmas. You can listen to The Secret Garden on librovox. We liked The Little Princess by the same author even more! Great picks for your family, Crystal and Happy New Year! Is Silas really really going to be 4 years old? Wow. Yes, can you believe it?!? He’s starting kindergarten next year! *sniff* But he told me that he’ll always be my baby. Love that sweet boy! I definitely will plan to do that, now that I actually set reading goals for our read alouds instead of just randomly choosing books as the year goes on! Mrs. Frisby and the Rats of NIMH is one of my all-time favorite books. There are two sequels written by Robert Obrien’s daughter, Jane Leslie Conly. The first is Rasco and the Rats of NIMH, and the other is R-T, Margaret, and the Rats of NIMH. Both are very good! I can’t wait to read it; it’s a brand-new title for me! Glad to see Carry On, Mr. Bowditch is on the list! It was my very favorite read-aloud in my 22 years of homeschooling. Have you read any of the Boxcar Children books? I LOVED those when I was around Kathrynne’s age (maybe a year or two older). The mystery ones might be a bit complex, but the first book is just fun! Kathrynne has read 30 or so of them… she *loves* them and looks forward to the weekly trip to the library so she can replenish her supply. 🙂 We’ve read a few aloud as a family, too. I was reading the description of some of the books you posted from your list. The book Beyond the River by Robert Elmer is from a series called The Young Underground. All the books in this series are free to check out and read on your kindle if you are an Amazon Prime member. We read the first book in the series after finding it free on Amazon. I was excited to then find the entire series on PaperBackSwap! You have some good ones on your list! You’re going to LOVE Carry On, Mr. Bowditch. It’s one of my favorites! 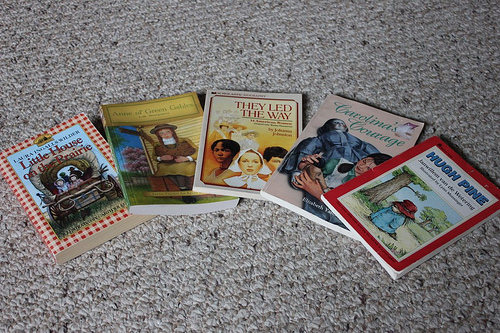 Caddie Woodlawn, Little House, Anne, Paddington – love them all! I plan on reading to my baby when he/she arrives (actually … I already have been, and he or she is still in the womb! Figure you can’t start too early 😉 )! I starting reading aloud to my husband when he was my boyfriend, at his request, and we really enjoy that and definitely want to continue it on with our children. This is such a useful list especially as two of yours are similar ages to two of my children. A very English recommendation but the “Milly Molly Mandy” books by Joyce Lankester Brisley are books set in the 1920s about a little girl who lives with her family in the little white cottage with a thatched roof. Four of the six volumes seem to be in print. They were part of my childhood and have been much loved by my daughters. Crystal, two other Christian fiction series that your girls might like are: The Mandy books by Lois Gladys Leppard. If you type “Mandy books” into Amazon, they will come right up. They are christian fiction mysteries. Also, the Grandma’s Attic stories by Arleta Richardson and Patrice Barton. I’d recommend My Father’s Dragon for your son. It’s actually a series of three. We have read it many times over to my boys. I loved “They Led the Way” when I was in grade school – good one for a young girl! Several of the commenters have asked where to get ideas for books to read aloud. May I suggest your local public library is an excellent resource. I work at our library in the children’s area. We regularly make suggestions for books titles, both to kids and parents. We can suggest books for specific subjects or interest areas. We also make suggestion of ‘read-alikes’–if you liked book x then you might like book y. This is especially helpful for reluctant or struggling readers. Many of the titles that are recommended are excellent books but one area that seems to be missing are newer titles. There are lots of new titles available that are excellent stories. You may want to ask your children’s librarian. Also, we love when kids come and tell us about books they loved reading. Just putting in a shameless plug for the services of local libraries! Happy new year! We LOVE the local library! We check out a big basket of books just about every single week. I can’t quite imagine what we’d do without it! Thanks so much for your work at your local library, by the way! My family has also always been library users. But since I have gone back to work, I have been amazed that many people don’t know the many services available at the library. My job is particularly rewarding because I am the outreach person. I take library services into the community to serve kids of all ages who might not otherwise get to use the library. Thanks for all you share and especially your encouragement to read out loud to kids! It is a great gift! One series my 8 year old son really likes is Christian Heroes series (written about men and women of the faith – George Mueller, Jim Elliot, Corrie Ten Boom, Eric Liddell). Also excited to have him start the Kingdom Series. Great list! Understood Betsey was a favorite when I was growing up. Rats of Nihm, as I remember, can be a bit intense– you’ll just have to see how it goes. I have read several of the Little House books to my 5 yo, but I skipped Prairie because of all the negative views of Native Americans. He can read that one when he’s older and more able to understand context. We’re on to Plum Creek now. One of our favorite read aloud books growing up was “The Bungee Venture” by Stan McMurtey. My mom read it during a car trip one time and my dad got so into it he missed an exit and ended up 50 miles in the wrong direction before he realized it. It is about going back in time to the time of the dinosaurs, so not sure how that fits into your worldview. But good fun. I love reading aloud to my kids and having them read to me too. We all loved the Janette Oke series..learned so much of how life was back then. They also loved Heidi. I read a lot..some say too much.lol..My son likes poetry and so I try to show him various types. I came across a book written totally in prose and thought it would be great as a read aloud. I didn’t care for the cover but started book. I could not believe how awesome the book was. Not only did it show how our country might look like to a small child from somewhere else, but it opened up so many avenues on how our life is seen by others. It is called Home of the Brave by Katherine Applegate and I hope you enjoy it as much as we did. Another good book was the Cay..about a boy going blind when shipwrecked. I look forward to more opinions of more books. We just finished Caddie Woodlawn in our Sonlight Core. Loved it! After we finish a book, my son and daughter have a friendly argument about whose bookshelf gets the book. Milly Molly Mandy and More Milly Molly Mandy are delightful books to read! Thanks for such an inspirational post! I love the idea of reading separately to your children. Thanks for the great post! I love reading and I’ve been reading to my son since he was a baby. He will be 8 this year and together we’ll be reading through the Harry Potter books. I really enjoyed these books and can’t wait to read them with my son! Some great books on that list! Anne of Green Gables is my all time favorite book. We just read Understood Betsy recently too. 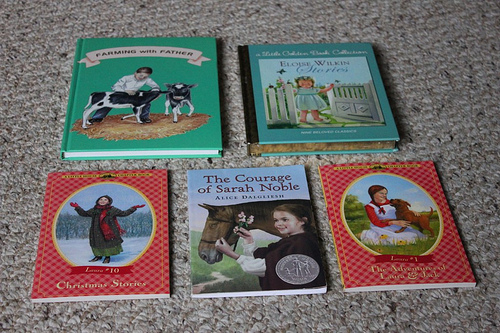 Some we love that we read this past year are; The Year of Miss Agnes, Betsy and Tacy Go Over The Big Hill, The Children of Noisy Village, and Casey at Bat. My 9, almost 10 year old has really enjoyed the Dear America Series too. Great list. Wonderful idea to plan out a reading list for the children. Nice idea. There are some nice titles that I’d love my children to read. I think it is a great idea. I’m just not sure what to add as their interest and curiosity change so often. I of course, there are classics that I’d like to expose my children to. Interesting post. Thank-you! Wonderful list. Carry on Mr Bowditch, The Borrowers, and Caddie Woodlawn are some of my favorites from my childhood. I hope you enjoy them as much as I did! Hope you love The Trumpet of the Swan as much as we did. I took a few suggestions as well, thank you! Caddie Woodlawn is another wonderful choice, as are the Paddington books. You might want to also check into the Betsy-Tacy series also by Maud Hart Lovelace. My favorite series of books ever, and that of my daughter, Tacy! Great selections! A good place to start for 8-12 year olds (or kids at that reading level) are the Newberry Medal winners and Honor books. They are very well written and include a large variety of of topics and authors. A complete list can be found at: http://www.ala.org/alsc/awardsgrants/bookmedia/newberymedal/newberyhonors/newberymedal. My only little one is two so I just try pick out some simple picture books that are not very long. She gets antsy sometimes when I choose long ones. Although maybe as she gets used or starts understanding what’s going on she’ll sit still. How early did you start reading to your oldest, and did you have any trouble keeping your children still when trying to read to them? Kelly, from my experience it is completely natural for your 2 year old to be antsy during reading time. When my first son was born, I had big ideas about reading to him all the time. He had other ideas. 🙂 My husband and I decided not to push it too much. Every few days we would sit down with him on our lap and attempt a short picture book. Sometimes he didn’t last long enough for us to open the book, and sometimes he lasted a few pages. Those short exposures were invaluable though, because by the time he turned 3, he was bringing us book after book after book to read to him. All of a sudden he wanted to be read to all the time! My advice is to surround your little girl with lots of picture books, and children’s books. Have them available, and keep trying. Soon the awesome day will come when she can’t get enough. I don’t know why I never thought of reading aloud during meals! What a great idea, thank you. I am curious how you decide what you are going to read aloud to your children? Do you look at any reviews or books that help guide you? Yes, I combine recommendations from others and books on books (like Honey for a Child’s Heart & Read for the Heart). These titles are so tricky to find in our library, any suggestions on finding free copies? Any book suggestions we have taken from your website have been FABULOUS! Thank you!!! Have you blogged about any recent read alouds titles? I keep checking and haven’t found any for 2015. I have blogged (I think!) about a few read alouds this year, but the best way to find them is either on my Pinterest Page (I have a board for books read in 2015) or my monthly goal wrap-ups. Ps. Thank you for being amazing!! If you look on Pinterest, you’ll see our book lists from the last few years. Lots of ideas there!